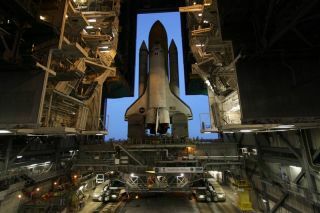 A looming traffic jam in space has caused NASA to push back theplanned launch date for the final voyage of the space shuttle Endeavour by oneday. Endeavour is now slated to lift off toward the InternationalSpace Station Feb. 27, 2011 ? a day later than previously planned ? to allowanother spaceship time to arrive at the orbiting laboratory. The fuel tank for Endeavour'slast flight arrived at NASA's Kennedy Space Center in Florida last month. The slight flight delay for Endeavour will clear the way forthe European Space Agency to launch an unmanned cargo ship ? the AutomatedTransfer Vehicle-2 ? toward the station. That launch, originally planned forDecember, is now tapped for Feb. 15, with docking at the orbital outpost slatedfor Feb. 26. Endeavour would then launch the next day and, if all goes asplanned, arrive at the station on Feb. 28. It will be a busy time in space, and that, in part, isbecause of anearlier bunching of planned flights at the end of this year. ESA officialsagreed to push back the ATV-2 launch to February because of delays from thecommercial Arianespace company, which builds the Ariane 5 rocket planned tocarry ATV-2 to orbit. The mission is the second flight of Europe's new unmannedspace freighter series. The firstATV, Jules Verne, completed a successful cargo-delivery trip to the spacestation in 2008. Meanwhile, Russia's Federal Space Agency will continue toferry cosmonauts and astronauts to the station on Soyuz flights during thistime. An Orbital Sciences Taurus Rocket is also scheduled to loft the NASAGlory climate satellite to orbit Feb. 23. The shuttle Endeavour will be making its last trip to spaceto deliver a nearly $2 billion cosmic ray particle physics detector to studyfundamental physics and cosmology questions. Astronauts will take threespacewalks to install the experiment on the outside of the space station. Endeavour's STS-134 mission was originally planned to be thefinal space shuttle flight before the three-orbiter fleet is retired. Lastweek, though, Congress passed a NASAauthorization bill that approved funding for one more shuttle trip ? amission for the shuttle Atlantis that would likely fly in summer 2011. That bill must be signed into law by President Obama beforeNASA has official approval for the mission. Experts say the president is likelyto sign the bill. POLL: What Do You Think About NASA's New Direction?